Much is written on the subject including node, mansions (or nakshatras), Lunation and more. For those who love Luna in her many aspects, I have created the Moon Phase Chain. Each link is carved front and back with craters of the lunar surface, each in a phase: full, waxing and waning, gibbous and crescent. Now available in a bracelet. The moon has been a powerful influence for centuries. The Lore of humanity across many cultures attribute to the Moon many things: from Lunacy to the tides. Watching the moon in it’s phases is something we have been doing for centuries. Learn more about my: Moon Phase Chain. 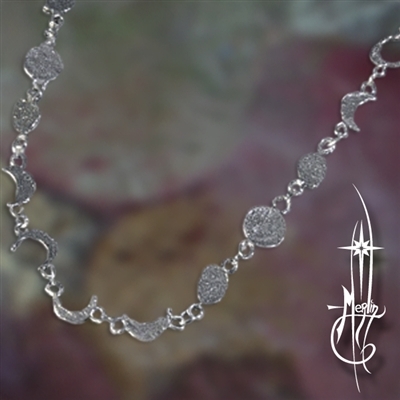 To Order you Moon Phase Bracelet please visit my Moon Phase Bracelet Page.